Wisteria has long been one of my favourite plants. 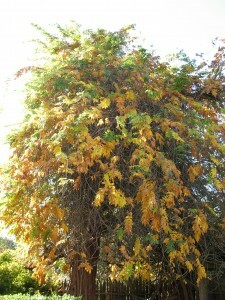 I love its twisty, ropy trunk, its vibrant green leaves, its heavy purple and white flowers, and its fuzzy seed pods. In the backyard of Nana’s house there was a venerable wisteria planted next to a pergola. In addition to growing over the structure, however, it had grown up into and taken over an old incense cedar tree. I wish I had a picture of it in bloom, but it was beautiful in the autumn as well. Before we sold the house, I saved a few seeds from that tree, and just a few months ago I finally planted two of them and delighted in watching the tiny leaves unfurl. Now, however, I get to look out my window every day and see a trellis full of wisteria on my front porch, which is one of my favourite features of my new apartment. That was indeed a fantastic giant wisteria at your Nana’s place. I’m glad you’ve got some of your own to enjoy now, too. It looks like a nice place.